Projects ranged from a craft brewery to a mining company. 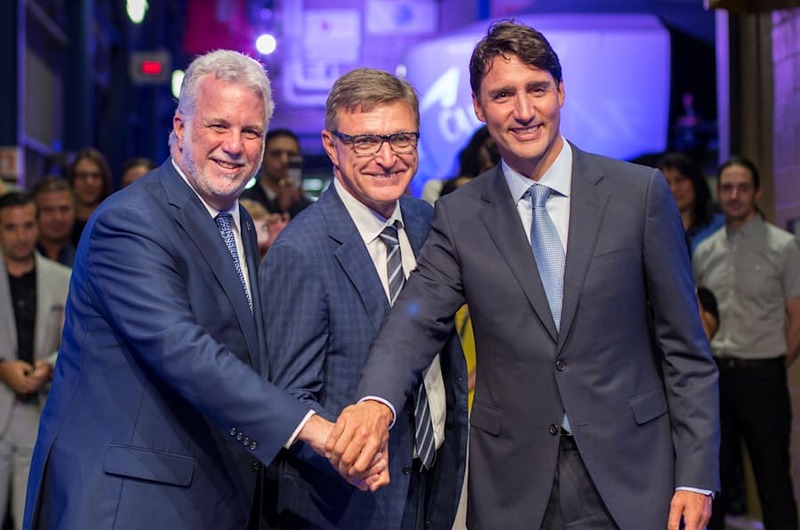 Prime Minister Justin Trudeau poses with Quebec Liberal Leader Philippe Couillard and CAE Inc. president and CEO Marc Parent after a news conference at CAE Inc., in Montreal on Aug. 8, 2018. OTTAWA — One year out from a federal election, Liberals announced more than $1.1 billion in spending across the crucial battleground of Quebec during a 10-week period this summer, an analysis by HuffPost Canada shows. From a $62-million infrastructure project to bring 14 Inuit communities online to $10 million to groom snowmobile and cross-country trails this winter, the cash was announced between June 21, after the House of Commons rose for the summer, and Labour Day, on Sept. 3. The $1.131-billion tally encompases only money for projects located solely in Quebec. It does not, for example, include $378 million announced in the Montreal riding of Outremont, where an upcoming byelection will be called, for research projects spread across Canada. Of the 157 projects announced, a slight majority were situated in opposition-held districts, with Liberal constituencies receiving 44.5 per cent of the announcements (70 projects), the NDP receiving 35 per cent (55 projects), the Tories obtaining 14 per cent (22 projects), the Bloc Québécois picking up nearly six per cent (nine projects) and Maxime Bernier's Beauce riding getting one project. Laval Boulianne, a federalist hotel owner in Alma, Que., who received $929,550 to renovate rooms in two of his establishments, said he doesn't think politics had anything to do with the decision to lend him interest-free money. "When it was announced ... people associated me with the Liberal party, but absolutely not," he told HuffPost Canada. "These days, politicians need to deliver the goods, not for one person, but for all the population." Alma is located in the riding of Lac-Saint-Jean which the Liberals won in a byelection last October, stealing a seat the Conservatives had held since 2007. Boulianne, who said he keeps his ideas to himself and has voted both Liberal and Conservative over the years, said he hasn't been active in electoral politics for 30 or 40 years. "Listen, politics today ... it is more trouble than it is worth, because governments change, and people change, and you are right away badly viewed to identify yourself with one party or another," he said. Lac-Saint-Jean benefitted from nine announcements this summer worth a total of $14.66 million. The Canadian Coast Guard icebreaker Louis S. St-Laurent makes its way through the ice in Baffin Bay on July 10, 2008. A $610-million contract was awarded to the Davie shipyard this summer. The largest projects, though, — a $610-million contract awarded to the Davie shipyard to build two icebreakers for the Canadian Coast Guard and $21.1 million to help a Sherbrooke company produce metallic powders for manufacturing and electronic products — were located in opposition-held districts. NDP MP François Choquette said he believes the Liberals are "of course" targeting every Quebec seat, but he doesn't expect them to use federal funds to do so. "I hope not. I hope they are offering economic development everywhere across Quebec and Canada in a fair and just fashion," he said. (A countrywide analysis by HuffPost of summer government spending shows most of the money flowed to Eastern Canada, where the Liberals hold most of the seats). Choquette's riding of Drummond received $1.48 million in infrastructure announcements to expand a local library, finance a youth employment centre and improve two sports facilities. Trudeau stopped by the riding this summer and was warmly welcomed as the first prime minister in 30 years to visit outside of an election cycle. Drummond hasn't had a Liberal MP since 1984, but the Grits lost the seat by only 2,040 votes in the last election. More than $68.7 million in spending announced over the summer was Quebec Economic Development Program funding — money aimed at boosting regional investments, supporting local jobs, and increasing tourism. $2 million to Michel St-Arneault, a company that makes french fries, so it could buy "potato transformation equipment, including a deep fryer, a freezing tunnel and the associated systems"
$500,000 to help Blücare Lab Inc., which produces granules to sprinkle into a cat's litter box in order to detect blood in the urine, to help fund scientific studies and develop their product. The riding of Gaspésie–Îles-de-la-Madeleine, where the Liberals unexpectedly won a seat in 2015, received funding for the most projects. The local MP, National Revenue Minister Diane Lebouthillier, announced $2,693,822 in investments in one day on July 12. She returned two weeks later with another $1,694,759 in loans and non-repayable grants. Her riding received almost a quarter — 24 per cent— of all the economic development projects announced in the province. the four-star rated L'Hôtel Baker Ltée (formerly known as L'Hôtel Des Commandants), which received a $57,000 loan to "improve the quality of 68 of the 70 bathrooms in the establishment's accommodation units"
Le Manoir de Percé, which received $50,000 to update its rooms and lobby area. A local outfitter, Camp de Base Coin-du-Banc Inc., was lent $45,000 to buy fat bikes and paddle boards as well as to improve its facilities for adventure-seeking tourists in search of an "authentic Gaspésie" experience. Three microbreweries, Brasserie Auval Brewing Co., La Société Secrète Distillerie Artisanale, and Microbrasserie Cap Gaspé Craft Brewing Co., received a total of $265,809 in loans to acquire equipment, secure a lease, or expand. O'Dwyer Distillerie Gaspésienne, a company that makes gin from the area's wild mushrooms was granted $148,433 to automate its manufacturing processes and expand its facility. The press release said one job would be created. While the Gaspé peninsula, traditional Bloc Québécois territory, has not been friendly to the Grits, they now hold its two seats. NDP MP Christine Moore's riding of Abitibi–Témiscamingue received the second greatest number of projects — 22 — announced over the summer. She is convinced the Liberal announcements reflect the work she and her staff have done and the strength of the region's business cases. "Maybe they think they can win the riding, but, on the other hand, our office really follows the files, we encourage people to apply to programs... I'm really focused on helping my community and, well, it's worked well." Moore proudly noted that when the Tories were in government, her riding was ranked No. 2 in terms of community infrastructure projects that received the most money. Moreover, she said, when Trudeau visited her riding in August, he brought her onstage and invited her to speak. "After I spoke, he highlighted my strength and courage so ... if I'm one of those targeted ridings, he has a funny way of acting!" she said with a smile. Trudeau wasn't the only party leader to visit Quebec ridings this summer. Conservative Leader Andrew Scheer also toured the province, as did NDP Leader Jagmeet Singh, who is trying to raise his profile among its residents. All three major parties see growth in Quebec as key to their electoral prospects in 2019. Right now, the Liberals hold a majority of the province's seats, 40 out of 78. The NDP has 15 seats, the Tories have 11 and the Bloc has 10. Samir Goulamaly, a communications adviser for Canada Economic Development for Quebec Regions, the agency now housed within Innovation Minister Navdeep Bains' portfolio, provided data showing the office's total budget of $276.5 million is slightly lower than in previous years. In the lead-up to the 2011 election, for example, the agency's funding was $537.3 million. Most of the money handed out is for interest-free loans that companies have about seven years to repay — a reimbursement schedule that typically is no more than five years with a 24-month grace period after the project has ended. Grants — cash with no strings attached — are provided to not-for-profit organizations, regional bodies that help with export development, and, occasionally, businesses. The overall repayment rate for loans is around 96 per cent, said Goulamalay. "All our repayable contributions get repaid, except in specific cases of clients that are in situations of failure to comply with the terms and conditions of the agreement, bankruptcy, insolvency, closure, etc., basically, where a client is in default of payment," he wrote in an email. The government's willingness to sign on to a project can help make all the difference, said Jean-Michel Laurin, a vice-president with NATIONAL Public Relations in Ottawa. The firm was hired to work with Bel Canada as it secured a $22.7-million package in financial assistance to set up a Mini Babybel cheese production plant in Sorel-Tracy, in Quebec's Montérégie region. Bags of Mini Babybel cheese snacks are seen at a grocery store in St. Marthe, Que. on July 13, 2018. The money (a $5-million grant and a $15-million loan from the government of Quebec as well as a federal loan of $2.7 million) was jointly announced in July by both levels of government just before the provincial Liberals headed into an election campaign. The provincial and federal governments' support, Laurin said, helped the company's Canadian office successfully convince Group Bel's headquarters in Paris to build the $87-million project in Quebec. "It was a project that the company thought was important in Canada, but they still had to fight internally to get those funds," he said. "It wasn't a given they were going to fund this project." François-Eugène Lessard, president of Les Bières de la Nouvelle-France, a microbrewery his parents founded in Saint-Alexis-des-Monts, said the federal funds help alleviate his stress about money. The company received $220,768 this summer to support its expansion, modernize equipment, and purchase a canning machine so it can finally sell beer in cans. "We could have gone to the bank. It would just have been a lot more stressful in terms of repayment — basically, this brings us a certain financial security," he said. Craft brewing is an exploding market, with 208 companies in Quebec alone competing for clientele, said Lessard. In 2010, there were 74 breweries in the province. "Now, there is about a new brewery opening every two weeks. Two every month." With the big multinationals buying up craft breweries — Molson with Trou du diable and Labatt with Archibald — Lessard said he's concerned that truly local merchants will be squeezed out from grocery store shelves and bar taps. "It's awful," he said, of their grip on the market. "I don't know what's going to happen, because, honestly, right now there is too much product on the shelves." Les Bières de la Nouvelle-France was one of seven microbreweries that received federal funding this summer. Goulamaly said supporting fast-expanding microbreweries fits into the government's goals of provincial support to high-potential companies because they capitalize on local know-how and help expand the local economy while maintaining or creating jobs. But for Renaud Brossard of the Canadian Taxpayers Federation, all this is just a ridiculous waste of public money. "Any subsidy like this should be eliminated," he said. "Too often it's opaque and there is little transparency and it is insane to ask middle-class taxpayers who have difficulty making ends meet to hand millions over to businesses that are worth millions or billions so they can continue their activities," he said. Economic development is important, Brossard added, but he said it should be done with money from the private sector. Companies should have to pay market interest rates and go to the private financial institutions to fund their expansions, he said. "An interest rate of zero, with inflation, that's a subsidy of two per cent a year we are giving them. It's a loss for taxpayers." Conservative MP Gérard Deltell told HuffPost he isn't concerned with regional development spending but he is alarmed that the federal Liberals can't seem to live within their means. "For sure the duty of the government is to make investments, wise investments, that will create wealth, that will create jobs, that will create a strong economy for Canada, but on the other hand you have to be very careful," he said. "When you have a government who spends too much, who has no control of spending, and who has no idea when they'll get back to zero deficit — that's all wrong. So this is why, based on those figures, we have to be very concerned with that." This is the second story in a HuffPost series digging into government spending.